An advertisement that appeared in American Art Illustrated in 1887. Prior to 1878 the company was known as the New England Glass Company. 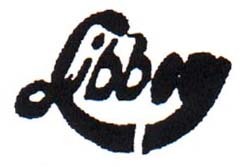 The “Works” name was adopted in that year and was used until the company moved from East Cambridge, MA to Toledo, OH in 1888 when it was re-named The W. L. Libbey & Son Company. In 1892 this name was changed to the Libbey Glass Company. The firm was founded as the New England Glass Company in 1818 in East Cambridge, Massachusetts. 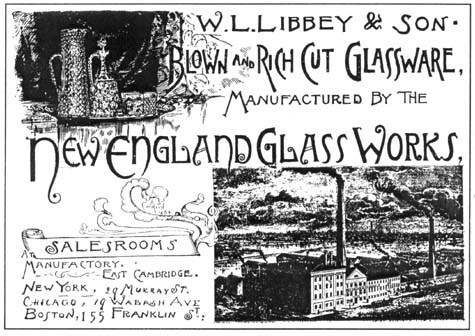 After it went out of business at the end of 1877, the factory was leased to William Libbey in January 1878 and became known as the New England Glass Works, Wm. L. Libbey, Prop. When William Libbey’s son, Edward, became a partner in 1880, the name was changed to New England Glass Works, Wm. L. Libbey & Son, Props. as it remained until 1892, despite the fact that William Libbey died in August 1883. In 1888 the East Cambridge factory closed and a new plant was built in Toledo and incorporated in Ohio as [The] W. [L.] Libbey and Son Company. In 1892 the name was changed to Libbey Glass Company, and in 1919 the company was reorganized as the Libbey Glass Manufacturing Company. In 1935 it was bought by the Owens-Illinois Glass Company, which became Owens-Illinois, Incorporated in 1987. Today the company is owned by Kohlberg Kravis Roberts. 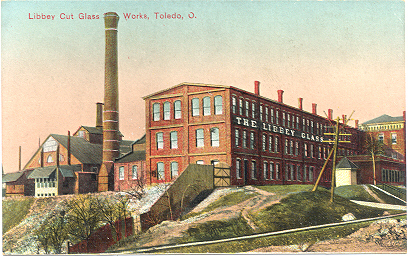 The Libbey Glass Company division, which makes tablewares, operates at its original site in Toledo. One of the founders of the New England Glass Company was the glass technologist Deming Jarves (1790-1869) who also established three other glass factories in Massachusetts. The Mt. Washington Glass Company was founded by him in South Boston, in 1837, for his son George D. Jarves. This firm became Jarves & Cormerais in 1850 and, during the 1850s, employed William Langdon Libbey (1826-1883) who, in turn, became sole owner of the factory in 1866. Libbey moved his business to New Bedford, MA in 1870, changed the company’s name back to the Mt. Washington Glass Works, and sold it the following year. A re-organization in 1896 changed the company’s name to the Mt. Washington Glass Company. Two years previously it had been acquired by the Pairpoint Manufacturing Company, a metal manufacturing business. Deming Jarves severed his connection with “The New England” in 1825 and founded his third factory, the Boston and Sandwich Glass Company, at Sandwich, MA on Cape Cod. He continued his association with this glasshouse until 1858 when he left it to establish his last factory, the Cape Cod Glass Company, also in Sandwich, for his son, John, who died in 1863. Deming Jarves died six years later (Newman 1977) (note 1). After he sold his Mt. Washington Glass Works in New Bedford, MA, in 1871, William Libbey became the agent (general manager) of the New England Glass Company in East Cambridge, MA. As indicated in Wilson’s summary, above, he continued his association with this company after it became insolvent in 1877. Upon his death in 1883 management was transferred to his son, Edward Drummond Libbey (1854-1925) who engineered the removal of the factory to Toledo, OH in 1888 where he championed the brilliant style of glass cutting that had become popular by the early 1880s and reached its heyday during the first years of the new century. Several kinds of art glass, developed and patented by Joseph Locke (1846-1936), were made in East Cambridge and later in Toledo. A detailed history of the Libbey Glass Company can be found in Wilson (1994, pp. 825-832). An extensive and details account of the trademarks used by the Libbey Glass Company (and its successor, the Libbey Glass Manufacturing Company) is contained in AMERICAN GLASS by K. M. Wilson (1994, pp. 839-847). Wilson discovered that the company “used at least thirty-eight different variations of trademarks on printed material or its glass, based upon these primary elements: LIBBEY with an eagle; LIBBEY with a blade (sword [, saber]); and LIBBEY within a circle” (p. 840). 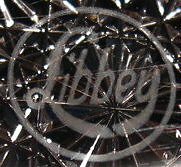 LIBBEY without a blade and LIBBEY’s star-in-a-circle trademarks are not mentioned by Wilson at this point, but he does consider them later in his report. It is important to realize that Wilson used only material that was available to him at the Toledo Museum of Art (TMA), and, although the museum’s collection of Libbey glass is extensive, additional trademark “variations” are, therefore, likely to be discovered. Dating the trademarks is often difficult because more than one version can sometimes be found to have been used simultaneously — at least on paper, if not on glass. Additionally, items given to the museum by the Libbey-Owens company in 1951 and 1969 have sometimes had acid-etched trademarks added at these late dates, even though the items were produced well before 1910. 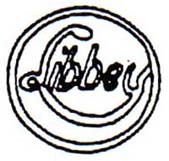 The LIBBEY within-a-circle mark from the company’s later years was often used in this way. Wilson mentions three patterns (from c1905) that “do not carry trade mark[s]” (Wilson 1994, pp. 840-841). At least two of them, however, have subsequently been found with the Libbey “sword” mark. Although Wilson lists the LIBBEY star-in-a-circle trademark — which was registered on 16 Apr 1901 — his comments concerning it are misleading. This trademark, which is not uncommon, was acid-etched only on blanks-for-cutting that Libbey sold to other cutting shops. The following summary includes, with two exceptions, only those Libbey trademarks that the collector is likely to encounter acid-etched on glass. Numbers in parentheses correspond to entries in Wilson’s table which should be consulted by anyone interested in the details of this subject. LIBBEY with an eagle (no. 2.5). This mark was used primarily during the 1893 Columbian Exposition, when it was stenciled on art glass. In spite of the inscription, it has never been found acid-etched on cut glass. Several years ago an example appeared on an engraved decanter, but it is now regarded as a forgery. Several variations of this mark were used in advertisements, 1889 to 1894. LIBBEY with a sword (no. 3.1). This trademark, registered on 21 Apr 1896, first appeared, acid-etched on cut glass, during the year it was registered. It continued to be used “until 1906 and possibly as late as 1910” (Wilson 1994, p. 841). Its appearance on glass varies slightly as illustrated by the following two facsimiles. The example on the right is classified as no. 3.3 by Wilson. Marks 3.1 and 3.3 are the most frequently found of Libbey’s “sword” trademarks. The writer encountered this “banner” trademark in the 1970s on two cut-glass bowls at an outdoor antiques show. The patterns could not be identified; they were of run-of-the-mill quality and contained pinwheels. The trademarks were thought to be fraudulent at the time, and current evidence would appear to confirm this. Perhaps they were copied from Keefe’s article, published in 1968. Wilson did not find the “banner” trademark acid-etched on any of the glass in the TMA’s collection. The writer would be interested to hear of any examples with this trademark acid-etched on glass. Oddly, this mark was chosen by Mark Chervenka as an authentic signature found on Libbey cut glass “ca.1906-WWI era” (note 3). LIBBEY-within-a-circle (nos. 9.3). Wilson found this trademark on cut glass that can be dated c1910. Therefore, Swan’s date of 1906, as the year this trademark first appeared, might be too early (Swan 1986, p. 311). As seen on the left, the trademark is found with a short break in the L-Y connection, below the letters b and e. When this connection is thick, and there is no break, Wilson classifies the trademark as no. 9.4. 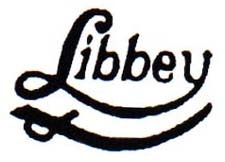 LIBBEY-within-a-double circle (no. 9.5). This trademark has been found on cut and engraved glassware made as early as c1920. Additional material may be available at the Toledo Museum of Art (TMA). f = microfiche available at the Rakow Research Library, Corning Museum of Glass. 1886: BLOWN AND RICH CUT GLASSWARE, MANUFACTURED BY THE NEW ENGLAND GLASS WORKS, W. L. LIBBEY & SON. Complete photographic catalog with original prices. Notation in pencil on title page: “June, 1886”. Cited by Wilson (1972, p. 365) who reproduces plate 8 and dates the catalog 1886. (The etching of the factory on the title page is dated 1884; the company relocated to Toledo, OH in 1888.) Has not been reprinted. CMG f-63c. c1893-c1918: THE CHOICE OF THE CONNOISSEUR, LIBBEY GLASS COMPANY. A composite catalog, with some original prices, published by the American Cut Glass Association in co-operation with The Toledo Museum of Art. 1996, xxi + 260 pp. 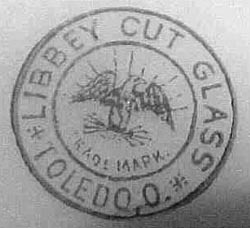 1896: THE LIBBEY GLASS CO., CUT GLASS. Reprinted by the Antique & Historic Glass Foundation of Toledo, OH, 1968, 25 pp. (TMA Archive No. 3). c1902: THE LIBBEY GLASS CO. Reprinted by the American Cut Glass Association. , ii + 45 pp. (TMA Archive Nos. 10 and 12) Out-of-print. f-1871C. 1905 and 1920: Both catalogs in LIBBEY GLASS SINCE 1818. Compiled by Carl U. Fauster. Len Beach Press, Toledo, OH. 1979, 415 pp. Out-of-print. Although she may have been something of an eccentric, Flora, who was well-educated and the daughter of Deming’s son, the dilettante and collector James Jackson Jarves, perceptively wrote — “It is useless to describe this silly fad for Sandwich glass which is trash. 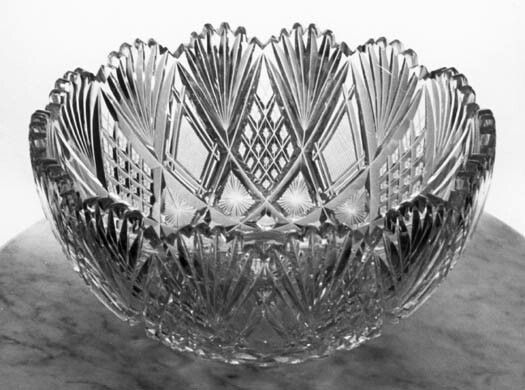 The real Sandwich glass is seldom seen and very rare.” According to M. M. Swan, Flora’s grandfather regarded the glass upon which his company’s reputation is based to be “potboiler stuff — pressed glass”. (Both quotes are taken from an article, Deming Jarves and his glass-factory village, by M. M. Swan, published in The Magazine Antiques, Jan 1938, pp. 24-27). 2. Keefe, J. W., 1968: Libbey cut and engraved glass, The Magazine Antiques, Sep, pp. 394-399. 3. Chervenka, Mark, 1994: Marks on cut glass, Antique & Collectors Reproduction News, Vol. 3, No. 10, pp. 8-12.
many pieces were produced before 1896, it is common to find pieces, like this one, that are unsigned. The pattern was never patented. Here it is cut on shape no. 211. D = 12.25″ (31.1 cm), H = 6.0″ (15.2 cm), wt = 11.5 lb (5.2 kg). Sold for $400 in 1988.